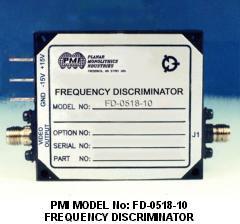 Frequency Discriminator translates incoming RF/Microwave signals into a monotonic output voltage that is proportional to the RF/Microwave frequency. 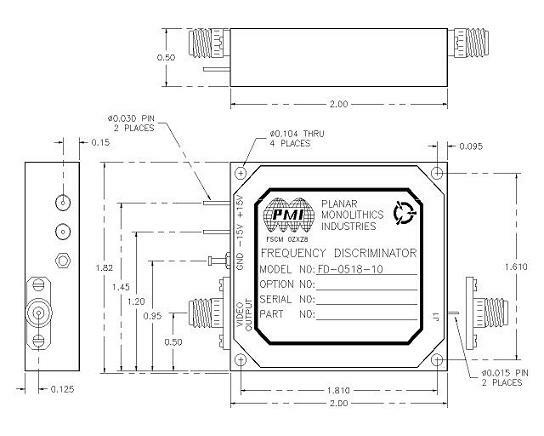 Accurate frequency information can then be derived from the Output Voltage because a Delay Line Frequency Discriminator takes the Input RF/Microwave Signal and produces two RF/Microwave Signal components that have a phase shift that is proportional to the original input frequency at fixed power input levels. By summing the two signal components together and then using detection techniques produces a detected Output Voltage that is frequency dependant. Therefore as the input RF/Microwave Signal frequency is varied so does the output voltage of the Delay Line Frequency Discriminator. Size 2.00"x 1.80" x 0.50"